The ruling Democratic Party of Japan (DPJ) is hastily selecting its new leader, following the sudden resignation of outgoing Prime Minister Yukio Hatoyama on Wednesday. 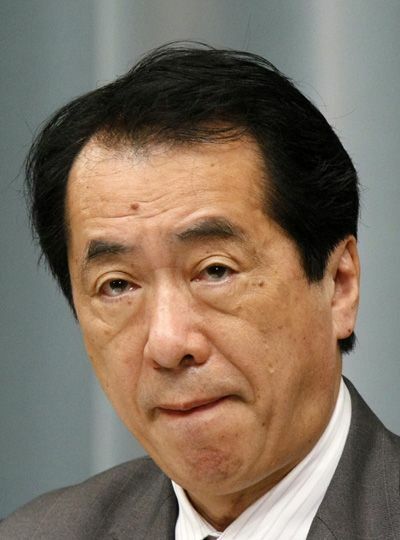 And Naoto Kan, the Finance Minister and Deputy Prime Minister, was the first to announce his intention to contest the position so as to the DPJ through an uphill battle to succeed in the upper house election this July. Following Hatoyama's resignation, Kan said that under the outgoing prime minister, the DPJ failed to meet the expectations of the voters it had pledged to support and represent and he would like to take over the job and make sure things get done correctly. Kan's victory is widely expected as the 63-year-old is no stranger to DPJ leadership: he previously held the spot when the DPJ was the largest opposition party in the Diet from 2002 to 2004. Kan hails from Ube City in Yamaguchi Prefecture, southwest Japan and graduated in Physics from the Tokyo Institute of Technology in 1970 before opening a patent office in 1974. Actively involved in various civic movements in his younger years, Kan lost three elections before winning his first seat in the lower house in 1980 for the now-defunct United Social Democratic Party (USDP) with a "civil guerrilla" grass roots environmental campaign. However, it wasn't until 1996 when, as health minister, he gained national popularity when he exposed the ministry's responsibility for infecting thousands of hemophiliacs with HIV- infected blood. At the time he was a member of a small coalition party under the Liberal Democratic Party (LDP) umbrella. In an era of bureaucrats and back room dealings, Kan's transparent politics were completely unprecedented and his honesty was enthusiastically praised by the public and the media, despite skeptics having Kan pegged as one of the old guard of Japanese politicians who rely on behind-the-scenes negotiations to drive policy and personnel decisions. In 1998, he admitted that he failed to make payments into the state pension scheme for ten months. Although the amounts were relatively small, he left to avoid hurting the party. Additionally, his image had been hurt by the revelation of an affair with a television newscaster. As atonement for disgracing himself and his party, Kan shaved his head, donned traditional Buddhist garb, and went on a pilgrimage to 88 rural temples around Japan. Known for his short fuse and fiery temperament, Kan is nicknamed "Ira-Kan" or "Fretful-Kan," suggesting he is easily irritated. He is not a "silver spoon" politician, who inherited his position through family lineage -- he's thought of as being a "grassroots politician." After Yukio Hatoyama resigned as the leader of the party, Kan assumed Hatoyam's mantle and in July 2003, the DPJ and the Liberal Party led by Ichiro Ozawa agreed to form a uniformed opposition party to prepare for the general election. During their very strong 2003 election campaign Kan was presented as the alternative candidate to then Prime Minister Junichiro Koizumi. His face was used as the trademark of the campaign against the LDP and he was viewed by many as a credible leader. However, in 2004, Kan was accused of unpaid annuities and forced to again resign the position of leader, although Kan claimed it was a simple oversight on his part. On May 10 2004, he officially announced his resignation, to save the party's reputation, but despite his transgressions, his time with the DPJ had positioned them as the only reputable opponent with the potential to go head-to-head with the ruling LDP and truly reform Japan's economy and administration. In mid-October 2005, Kan proposed the creation of a new political party to be called the "Dankai (baby boomer) Party," but it wasn't until January 6, 2010, when he was picked by Yukio Hatoyama to be the new Finance Minister, assuming the post in addition to deputy prime minister, that his career really started to take flight. Kan announced his priority was stimulating growth and took the unusual step of naming a specific dollar-yen level as optimal to help exporters and stimulate the economy. He has advocated more fiscal austerity and tax rises to reduce Japan's ballooning public deficit which is nearing 200 percent of gross domestic product and warned on his blog recently that Japan' s public debt situation is worse than Greece's. Kan has stressed the importance of fiscal reform and argues that the government should urgently consider an increase in the consumption tax, he is known for leading hard on the central bank to do more to tackle deflation. Politically, Kan opposed Japan's sending of troops to Iraq but has also advocated a greater role for Japan's military, which is restricted by Japan's pacifist constitution. DPJ lawmakers will vote in a party election on Friday to select and announce its new leader, who will assume the premiership. The DPJ is planning to ask parliament if the new prime minister can form his Cabinet the same day. Should Kan win, it would make him the second leader since the DPJ swept to power in historic elections last August and Japan's fifth prime minister in less than four years. Kan's seniority in the party and more than three decades' experience in parliament will stand him in good stead on Friday and he is widely regarded as the safest bet to lead the party through its current times of turbulence and his younger years as a civil-rights activist and his fiery temperament make him a unique character amongst his peers. Kan is married with two sons, and lives in western Tokyo and said to very much enjoy the ancient and notoriously difficult Japanese game of "Go" and is reported to be a connoisseur of shochu, a strong drink traditionally preferred by Japan's working class men. Why Prime Minister Hatoyama resigns abruptly? Ties with Japan won't change after Hatoyama's resignation: U.S.